Ozone co-founder Matt Taggart (48) and Sam Bullock (26) hit the water with their support crews to attempt the race, from Devonport Wharf to Russell Wharf in the Bay of Islands. Franck Racing smashed the record in 2014 with a time of 5 hours 13 minutes in ideal strong southwest winds, and the kiters were feeling confident of getting close to that time in the right conditions. Although kiters aren't officially 'in the race' as yet, taking part had been a bucket list dream for Matt since 2012 and he managed to finish in 6 hours and 45 minutes, beating the record-holding Frank Racing Trimaran by 23 minutes. 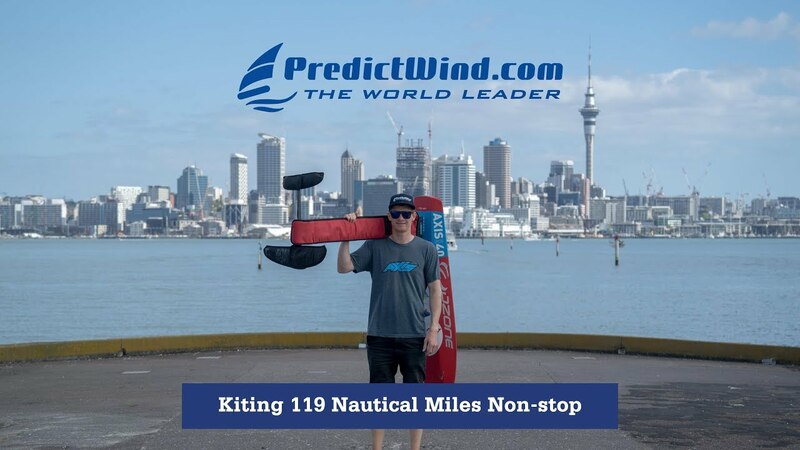 Fellow kite foiler Sam Bullock crossed in the line in 6 hours and 32 minutes. It was far from plain sailing, though. It's incredible how the mind forgets the slog and grind so quickly. Although I was ecstatic to have finished the race and beaten Frank Racing's Orma 60’ Trimaran, when I crossed the finish line I was certain I wouldn't enter the race again. However, within a few hours we were already planning next years attempt and hoping for better conditions. I'd done so little kiting over that year with injury after injury plaguing my aging body, so I didn't know if I'd be able to handle the distance. We arrived in Auckland the day before and headed out on the 9.5m Protector, an ex Team Oracle AC chase boat with a 250cc outboard. I knew it would be hell for my support crew in the rib for such a long distance. Skipper Luke was no stranger to the Coastal Classic though, having windsurfed it three times and sailed on Frank Racing's Tri many times, including when they set the current race record in 2014. We set the boat up and attached bar and lines to my Ozone R1V2 kites so they'd be ready to launch from the support boat if the wind changed dramatically. Of course we all dreaded even trying to hot launch a foil kite off a rib in a rolling open ocean, but we had a system to try if needed. Race day dawned and the forecast was for ESE with the Predict Wind (www.predictwind.com) race routing forecast showing we would have no tacking. I dropped the guys off at the support boat, now fully pumped with anticipation. I started thinking I must be nuts while driving back to Mission Bay where I'd launch on my own, as the wind was still very light ENE, around 3-6 knots. I finally launched my R1V2 15m on 15m lines, 15 minutes before the start. My heart was racing and my main concern was staying out of the way of the 160+ yachts. As we were unofficially entering, my worst nightmare would be that we got in the way of the yacht entries. We both planned to start with the A Class yachts, the last start sequence with the smaller slower yachts having started earlier. Our main goal was to beat the legendary Frank Racing Oram 60’ Trimaran into Russell. Sam was on his R1V2 13m with 12m lines and was ripping around the start line, looking fast and very comfortable. The radios we had bought for comms stopped working as soon as the race started, which really pissed me off, as I knew it would stop the guys being able to keep pressure on me. I also knew it would be a boost to have friendly voices giving me encouragement and info. Sam had nailed it with his Predict Wind team being set up with the amazing BB Talking voice activated, fully waterproof headsets, which they said performed flawlessly. I was wearing an Ozone prototype impact vest with my useless VHF radio, large pockets full of energy gels, an Epirb and a camel back with Tailwind Energy drink. I also had smoke and aerial flares in case I was separated from my team. As we sailed out of the Auckland harbour my legs soon started feeling the pressure. It was intense with so many yachts to stay clear from, but looking back, that part was really exciting as I got incredible cheers of support from all the boats we passed. I started to really miss having radio contact with my support crew and Sam was pulling away. In hindsight I should have tacked less and stayed further offshore, fuel saving was high on Luke's mind, so he was staying on a direct line. Missing comms started playing with my mind and instead of focusing on the route, I ended up tacking way too much on a brutal 60+km upwinder. Wondering where my support crew were and feeling lonely I sailed into a wind hole. My kite went down and I wondered if that was the end of my race. I managed to relaunch eventually, but had to loop it forever without enough wind to even get up and riding. Any of you kiters will know how exhausting that is! After about 20 minutes I managed to get going again, but my VMG (velocity made good) was useless and I was heading back to Auckland! The wind picked up and I got flying again at last, but full concentration was required as the sea state was heavy and the headlands on the horizon never seemed to end. I had got into a good head space but my legs were jelly and I was foiling out and suffering heavy crashes every 2-5 kilometres. Luke, Morgan and Jim were at full tilt in the RIB, struggling to keep up. Every time I crashed they could make up ground. Grabbing food and drink on the go was a fun change and their shouting and encouragement was a huge boost. Eventually the iconic headland of Cape Brett came into view and, as I slowly came upon her with the bird and sea life going crazy all around us, I knew we were going to make it unless the wind died. I was fully lit on the 15 metre at that stage, loving it with a high average speed and trying my best to not crash. On the final gybe into the Bay of Islands I found my legs just wouldn’t move. A huge explosion followed by 50 metre upwind body drag, I felt like a human lure in what looked like Jurassic Park waters, with boil ups happening everywhere. It’s a crazy spot. My legs were like lead weights when I got going again and I almost hit a Great White, passing it at 28 knots. That got the focus back quickly for the last stretch into Russell! Crossing the finish line twenty three minutes ahead of Franck Racing was an incredible feeling and experience. I guess that feeling of accomplishment is why we always go back for more and how we can handle the pain. The coastline is spectacular and I feel privileged to have been able to tick that one off my bucket list and look forward to seeing more kiters on the start line in the future. Finally ashore, I enjoyed the most intense and beautiful hot shower of my life before heading straight to the iconic Duke of Marlborough pub for the biggest feed and refreshment intake ever. I'd like to thank Luke Wigglesworth, Morgan Coster and Jim Burcham for their amazing support and perseverance. Handling 6.45 hours in a rib at full speed is insane! Huge congratulations also to Sam Bullock and his Predict Team support crew for finishing 12 minutes ahead of me. Next year we will have BB Talkin headsets. See you on the start line! Hopefully we can work with Yachting New Zealand to be able to satisfy the PIC Coastal Classic Race organisers in working towards kiters being able to sign up as an official entry.